According to the Nielsen ratings, nearly 7.5 million viewers tuned in for the October finale of VH1's "Flavor of Love." It is the highest rated show in the history of VH1. This is Flav's second, third or fouth successful act. He was the comic relief for the dead serious globally successful rap group Public Enemy. 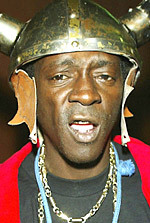 Flavor Flav, left, hit with VH1's "Surreal Life," where his romance with Sylvester Stallone's ex-wife Brigitte Nielsen wowed viewers. He joined with Nielsen for the hilarious "Strange Love," and now "Flavor of Love" is a super hit. And Flavor knows about controversy. When Professor Grif got Public Enemy in trouble with anti-Semitic statements, the world caved in on the group. Those now calling him a minstrel are probably unaware that his character is over 20 years old. His trademark clock made its debut when Ronald Reagan was still president. William Jonathan Drayton, Jr., 47, is a charming guy who has created a compelling character. Coming back from the bottom must be sweet joy for him. When you've been to the top and then to the bottom, it must feel very good to beat the odds and get back up on top. Go get'em Flav. We'll be watching every step of the way.